Having health insurance offers Karen Miller, a longtime resident of Artesia, peace of mind as a real estate agent. Miller knows the importance of being covered by a health insurance plan, as a family member was unexpectedly diagnosed with a severe health issue. 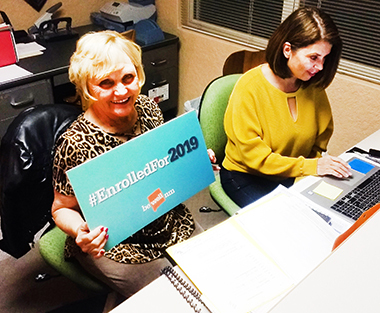 When it came time to re-enroll in health insurance this year, Miller went to her friend and insurance broker Dora Lopez, whom she has trusted with her health insurance needs for many years. Being able to keep her same health plan and paying less for it was exciting news for Miller. Knowing health insurance isn’t just for medical emergencies or urgent medical needs, Miller uses her coverage by getting yearly check-ups, which are free with any Marketplace plan. Getting an A+ on her health report from her doctor and paying nothing out of pocket, Miller leaves her yearly check-ups both happy and healthy. Miller’s health is important to her, as she is quite active, showing houses throughout the day and walking or biking around her neighborhood in her time off. Appreciative for the expertise that beWellnm certified broker Lopez is able to offer and the friendship that was built, Miller is eager to share her story with others. She takes comfort knowing that if the unexpected were to happen, she is covered by a Marketplace health plan. beWellnm’s open enrollment period ends Saturday, Dec. 15. New Mexicans are encouraged to visit www.OSICompareHealthPlans.org to use the health-plan comparison tool to find plans that cover their doctors and prescriptions. Additional information and in-person assistance is available at beWellnm.com.